We draw on a six-year collaboration to look at how science benefits from embracing a wider perspective on creativity. Our joint project started with an art-science speed-dating event, aimed at building collaborative teams. 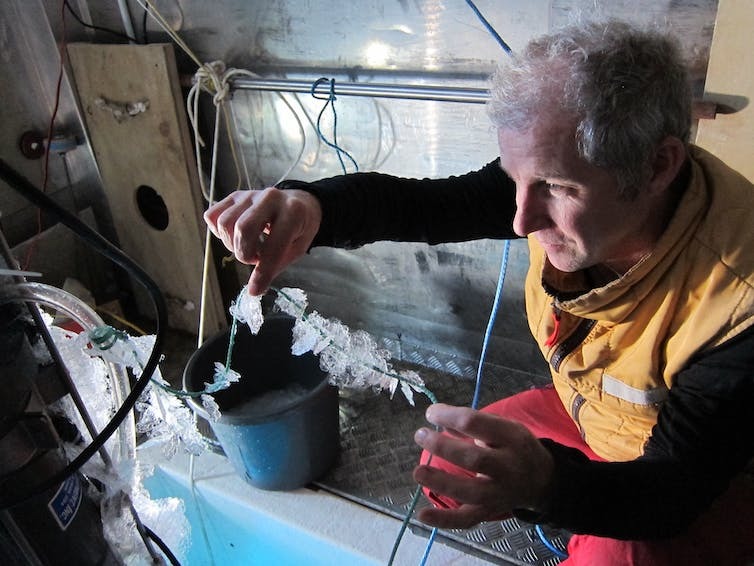 Our connection centres around an Antarctic research project investigating the formation of platelet ice, which plays an important role in the annual growth cycle of sea ice around the Antarctic continent. In particular, the science looks at how tiny ice crystals influence much larger climate processes. We were able to build on the intrinsic fascination people have with Antarctica and the interest in climate science. The scientists acted as a conduit of research to the artist. This added another layer of meaning to the artwork and an entry point to conversations around Antarctic ocean processes and climate change. This loop of enquiry seems to happen differently in art-science collaborations. Our collaboration has evolved from arm-chair slide shows, through cross-disciplinary participation and Antarctic expeditions, to a final stage that includes a proliferation of ideas around art, education and science. The benefits to science can be difficult to articulate but chief among them is a reminder of the importance of open-ended exploration. Another is to be asked questions by someone who spent even more time simply looking at the object of scientific inquiry than the scientists themselves. The first phase of our project was to find a catalyst to connect enthusiastic creative people. A second phase followed with the science team taking basic components of an art work (a large paper sculpture) with them to Antarctica and assembling them as they saw fit, much like a piece of science equipment. This had impact, but was probably detrimental to the power balance in the collaboration because it left the scientists in control of both the art and the science. It turned out that the scientists didn’t follow instructions, and instead responded to the constraints of the working environment – much like the art practice. Artist Gabby O’Connor spent hours photographing platelet ice retrieved from underneath Antarctica’s sea ice. Gabby O’Connor’s Antarctica Studio/Craig Stevens, CC BY-ND. The next step involved getting the artist to Antarctica, embedded with the science. This had to be navigated carefully to ensure that the art retained its own priority as well as collaborating with the science, rather than being simply co-located. A cornerstone to this was a request that the artist should make scientific measurements and, by doing so, added a whole new dimension where by there was an art perspective on the actual scientific process. In the past, artists were often involved in research purely to document the science. Captain James Cook took the painter William Hodges to polar extremes where he captured Antarctic seascapes. When the paintings were prepared for an exhibition in 2004, X-radiography revealed a different and unfinished view of icebergs in a rough sea. Edward Wilson, a doctor and artist, accompanied Robert Falcon Scott to the pole and beyond. In some ways, these people acted as impartial sounding boards for the explorers and scientists at the time. The ease with which photography is achieved today has reduced the need for this role, but has something been lost along the way? Much has been written about how facts alone do not convince people. A sideways approach that comes from an entirely different artistic perspective might therefore have a chance of penetrating established boundaries. Platelet ice. Gabby O’Connor, CC BY-ND. Where once science was its own domain, this is no longer the case. Implications of research findings need to connect with broader audiences. But how can you explain something you barely understand yourself to multiple publics? Analogues with popular culture can bridge this gap. With around 90% of New Zealanders and even more Australians engaging with art, it provides a useful conduit to science. Our collaboration was initially largely unfunded and viewed as an irrelevant curiosity. However, support built quickly, to the point that the project was used to open a recent national Antarctic Science Conference. Through all the phases of our work, we made connections with young people. We had sufficient support from teachers to develop workshops and extra-curricular activities for schools, and the climate topic made this part of our engagement more effective. Platelet ice builds up on the underside of sea ice and has to be sampled through carefully melted holes in the ice. Gabby O’Connor, CC BY-ND. What is in it for science? Lots, it turns out. The scientist is reminded of the power of curiosity, something that can get lost in times of targeted research. The artist also asks questions based on hours and hours of observing the system at hand. Somewhat unexpectedly in our case, the artist became a documentor of the work in a way that we hadn’t previously achieved. Added benefits are embedded with the next generation of scientists who will more readily span the divide, to the extent that they may not know a gap once existed. Also, part of the future science cohort may exist simply because of the inspiration found in art that connects with science. We are at a time where the entire collective knowledge of our species is available with a stab of a fingertip. It becomes possible, necessary even, to leap across disciplines to generate new ideas. 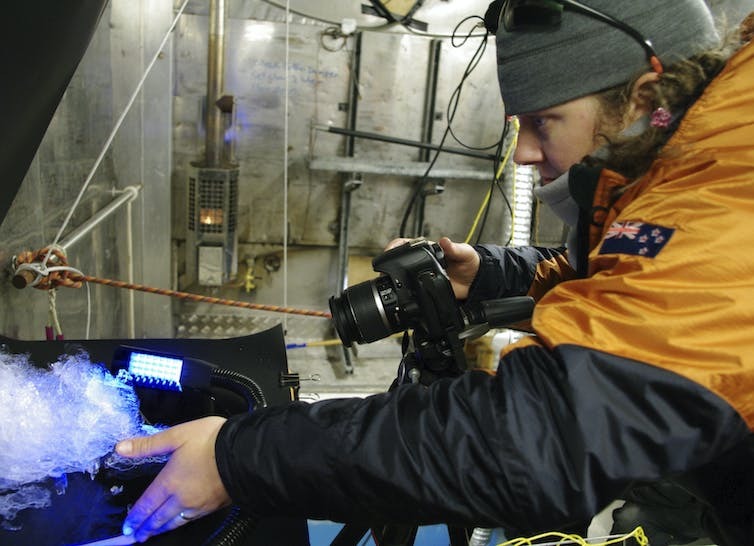 Featured image: The authors have collaborated on an Antarctic research project, investigating tiny ice crystals and their role in climate.